Make someone's day with a gift of of our delightful 8 inch Luv To Cuddle plush teddy bear by Aurora! 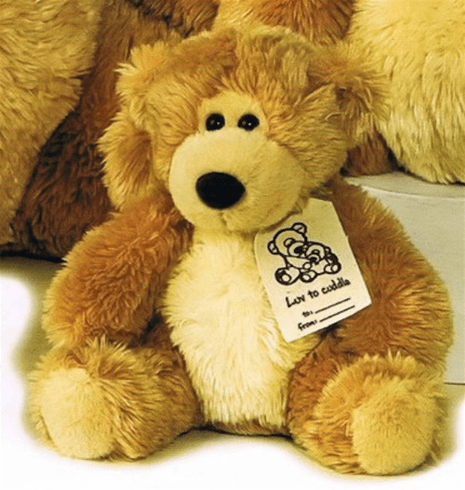 Measuring 8 inches in size, our 8 inch Luv To Cuddle plush teddy bear is crafted from a shaggy, soft honey colored plush with a light tan chest, muzzle and footpads. A dark nose, bead-style eyes, and wide grin give this bear a fun, whimsical touch. Each bear also comes with its own Luv To Cuddle tag that you can personalize yourself. And, just like all of the quality stuffed animals from Aurora, our 8 inch Luv To Cuddle plush teddy bear is made from only all new, quality kid friendly materials that meet or exceed all U.S. safety standards, ensuring your new stuffed animal will be around for a long time to come. We suggest surface washing for our 8 inch Luv To Cuddle plush teddy bear; recommended for ages 3 and up.